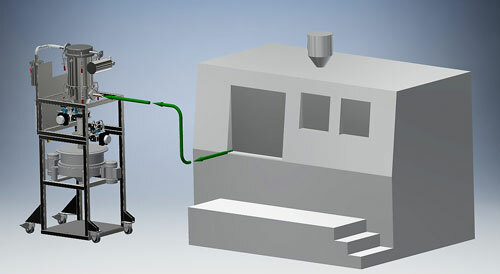 The newly introduced metal powder recovery system by Vac-U-Max, maker of pneumatic systems and support equipment, increases productivity of additive-manufacturing (AM) machines by extracting powder from the printing bed using vacuum and then sieving the powder for future use. The closed-loop system prevents operators from coming into contact with the powder. Compressed air-driven vacuum generator with ½-in. NPT high-pressure air connection and variable orifice assembly for adjustment of vacuum levels. The generator requires 35 cfm @ 60 psi. Vacuum receiver package with 36 sq. ft. of filter area and counterweighted discharge valve. The component is made of 316L stainless steel. High-output suspended vibratory sieving machine with US230 stainless-steel mesh and ultrasonic deblinding kit. Rolling-square-tubular frame with locking casters and made of powder-coated steel.